The town of Lexington, South Carolina is seeking to condemn the temple of Lexington Lodge 152 using eminent domain for the purpose of constructing a parking lot for a proposed new Springhill Suites by Marriott hotel across the street. There seems to be a somewhat yawning abyss between the two sides concerning the temple's value. There has been some controversy over the proposed development, primarily about traffic. But then, there’s always concern about traffic in Lexington. One of the main worries of residents and those who do business in town is parking for the hotel. There is precious little parking already and the idea of adding an 80-100 room hotel only elevated curiosity about the project. Across Butler Street. a block north of Main Street is the Lexington Masonic Lodge #152. 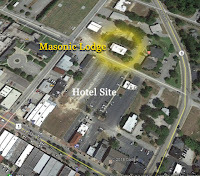 According to one Mason who spoke to L&M, Lexington Mayor Steve MacDougall – the main proponent of the hotel – sought to condemn the Masonic property using the authority of eminent domain and construct a parking garage that would service the new hotel. The Lodge would be compensated for the property, but, apparently, in the $300,000 range. The group rejected the offer because the proposed purchase price was far too low. 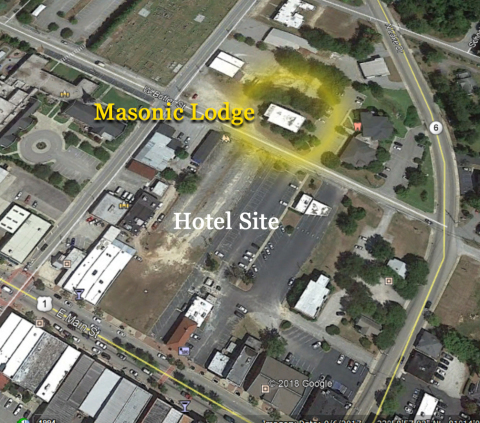 To rebuild and relocate would cost the Masons an estimated $1 million, effecting an almost $700,000 loss for the lodge. Such is the way of eminent domain. Government decides that private property should used for purposes it determines is “in the best interest of the public.” Assessed value is determined as the purchase price with no regard for owner sentiment or the cost to relocate the residence or business. Supposedly, the Lodge and Town are negotiating for a solution, but confirmation from the Town or members of the Town Council is difficult. Lake and Main has confirmed that Mayor MacDougall was invited by the Lodge to discuss the issue, but he sent surrogates in his stead. That confirmation had to come from outside the town council because such matters are discussed in closed or “executive” session, away from public scrutiny. Contract negotiations can be delicate and it is considered prudent to be discrete. Nonetheless, to condemn via eminent domain the property of such a vaunted organization as the Freemasons is distasteful. It is, of course, the business of the Masonic Lodge what terms will be satisfactory, but woe betide the Mayor if the Town under his direction attempts to force the issue over the Masons’ objection. The $300k figure (called “range” in the article is the assessed value of the property. Mayor MacDougall’s plan to condemn (the proper term) the property under eminent domain is based on the assessed value as the initial compensation. If rejected by he owner of the property (the Masons), negotiations are conducted to reach a compromise. That is what happened. Ultimately, if the two parties cannot resolve, the Town can “condemn” and confiscate it and pay the assessed value. 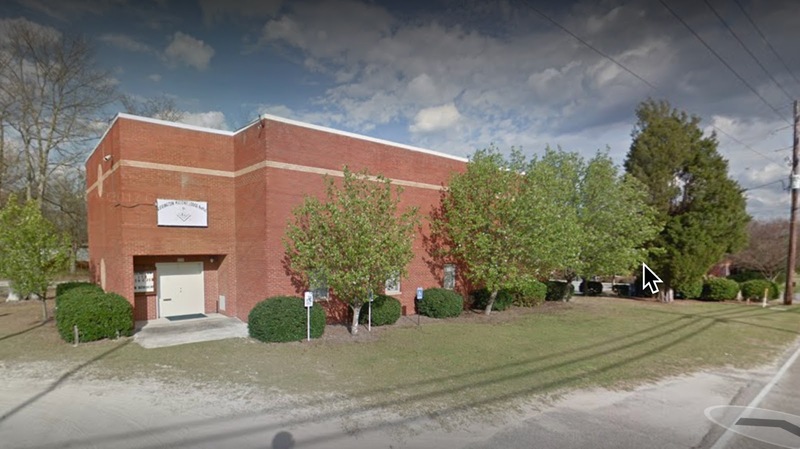 In this instance, it has been determined that it will cost the Masonic Lodge an estimated $1 million to purchase land, build a comparable facility and relocate. The Town will most certainly not pony up a million dollars to buy land to build a parking lot/garage for the hotel Mayor MacDougall is promoting. The negotiations are ongoing, though, so it will be the decision of the Lodge as to the outcome. There are “rumors” about a possible solution, but that could not be verified, so it was not published. I am sure that there are differences in state laws, but I serve as a Land Commissioner in Mobile AL. My experience is that the state rarely offers a "fair" price but most of the property owners fail to hire an attorney and seldom bring evidence to support their claim. This should go to court. Its hard to think that the Mayor would lead the charge in demolishing a church or synagogue, or the local historical society. Besides destroying the building, the town fathers seem bent on destroying part of the community's past. Sad! The least the town could do is give the cost to relocate, build etc. the town and hotel company would easily make their money back and then some in a couple years. Assuming they know how to properly market. Thhis is a real streach of legal "eminent domain" since the avowed purpose is to take private property for the use of a business. This was allowed for a short period, before it was found unconstitutional by SCOTUS, and during that time we lost the property of Pompano Lodge $263, F&AM to the city of Pompano Beach, Florida, to be oart of their "redevolopment" plan for their downtown. The Lodge was on the bloakc next to City Hall. Here the proposed "parking Lot" is transparently intended to allow the Hotel to have parking available for its guests, even if it belongs to the city, and so full market value of the property, including the building and all facilities on it, should be demanded and paid. In out court battle with the City of Pompano Beach, the Judge at one point threatened to jail the City Attorney for "contempt of Court" for submitting a wildly low ball offer for possession of our property. He also threatened to reverse the "Order of Taking" with the stipulation that there would not BE any further "Order of Taking" before the City agreeded to the widely recognized value of the property. Ah, the Kelo decision raises its ugly head yet again. There are always options, including the developer incorporating a parking garage on or under the first floor. It almost sounds like the mayor or council has an interest in the property. Lodges were occasional incorporated into the floor plan of hotels and office buildings back in the late 19th and early 20th century. Just give the Lodge their own floor in the new place and call it a day. They still are, London having a number of such situations. The famous Cafe Royal has a busy set of lodge rooms. I suppose the Shrine in Washington could be mentioned as it interfaces with the adjacent Marriott. At least one Mexican lodge i have visited is virtually seamless with a popular restaurant and of course uses it. There are law firms that specialize in cases such as this. I don't know of one back east, but a good lawyer in Charlestown or Columbia could refer the lodge to a specialist so that the lodge would get Fair Market Value for the property. In California, where I live, I believe state law requires FNV but govt frequently doesn't pay it voluntarily. I am an officer of Lexington Lodge 152. There is most definitely a lot of talks going between the town and the lodge. Unfortunately none in the favor of the lodge. The latest offer was to purchase our land out right and give us land behind the building after they eminent domain the property owners behind us who at this point has no clue of the events. The town is definitely over stepping their boundaries a bit here. This lodge has been here since 1860's and we have been up to code on everything we do in regards to the town. We have continuously refused the offers from the town due to the fact that none of them have been sufficient enough to allot us the ability to move away from our lodge into a new or used building big enough in the area for all of our members. as it stands we have over 300 members, the lodge is far higher appraised market value then the offers provided, we have hired an attorney and a realtor division to take on the task of fighting the town. so far there highest and best offer has not succeeded half of the appraised value on the lot and the building combined. The town seeks the property and does not want the building even though they are going to demolish it to turn it into a parking lot for an upcoming hotel. In fact the town hall is so petty that on it's last offer to us it came in the form of a hand written sentence on a torn out notebook piece of paper with no official signature or stamp. We meant so much to the town and their time that they sent us that as our offer. Disrespectful, especially at the mention of condemnation. It won't be the last that the Mayor Steve hears from us on this matter and we will keep pressing until either they leave us alone or we receive fair and just compensation to close out a deal that all of the lodge can agree on. Voting season is neigh and I can assure you that many of our members including myself will be voting for a better future in the town. This comes as many items stack within the town that appears outwardly as chaos and dirty deeds are conducted within the hall.